Our Shadow cruisers are some of the most popular bikes on the road, and one look at the Shadow Aero will tell you why. Features like its spoked wheels, full fenders and long, chromed mufflers are all about taking it easy and looking good while you’re doing it. But the Aero rider also gets some thoroughly modern performance courtesy of this bike’s 745cc V-twin engine, specially tuned for low-revving torque. Maintenance-reducing features like shaft final drive make this motorcycle truly easy to own. Plus, the Aero is a huge bargain, giving you a big-bike ride without the big-bike price. The Shadow Aero® serves as one of the most satisfying ride for a wide range of enthusiasts. 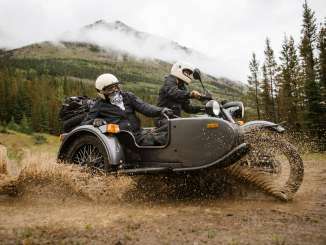 Features like its spoked wheels, full fenders and long, chromed mufflers are all about taking it easy and looking good while you’re doing it. But the Aero rider also gets some thoroughly modern performance courtesy of this bike’s 745cc V-twin engine, specially tuned for low-revving torque. Maintenance-reducing features like shaft final-drive system make the Aero easy to own. And best of all, the Aero is a huge bargain, giving you a big-bike ride without the big-bike price. Forget about fiddling with a choke—the Shadow’s fuel injection system means no-hassle startups on cold mornings or at high altitudes, and optimal performance in any condition. It’s the best of both worlds: The three-valve combustion chambers used on many of our V-twin cruisers feature two intake valves and one exhaust, helping them breathe efficiently to boost both horsepower and torque. Wide-ratio five-speed transmission lets you cruise the boulevard at a low, unhurried pace, yet allows you to hop on the highway without revving the engine through the roof. Clean, efficient, proven, low-maintenance. Shaft final drive is the perfect choice for a machine like this, and for riders who pile on the miles. You never have to worry about lubrication or adjustment out on the road. And an added plus: it helps keep your bike cleaner, too. 745cc liquid-cooled V-twin engine produces impressive power over a broad rpm range. 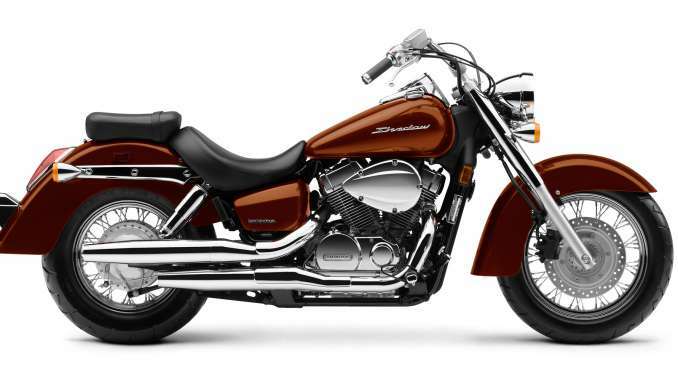 Crankshaft features long-stroke design to produce strong V-twin feel and low-rpm torque peak. Programmed Fuel Injection (PGM-FI) for good throttle response and fuel efficiency. Custom two-into-two exhaust system, flowing into bullet-style mufflers provides soul-stirring sound that’s classic V-twin cruiser. Shaft final-drive system provides smooth and reliable low-maintenance operation. Chrome highlights throughout provide classic styling. Wide metal front fender adds to the bike’s classic appearance. Sturdy 41mm front fork features large-diameter chrome-steel shrouds and large billet-aluminum triple-clamp for a distinctive retro look, and delivers confident, neutral handling control and plush 4.6-inch wheel travel. Dual-shock rear suspension features five-position spring preload adjustability and eye-catching chrome covers, while offering 3.5 inches of wheel travel for a smooth, well-controlled ride. Single front disc brake with twin-piston caliper grips a 296mm drilled rotor between sintered metal pads. Rear brake is drum type. Low 25.9-inch seat height makes flat-footing it at stoplights or in parking lots a breeze. Tank-mounted speedometer in a stylish 3.7-gallon fuel tank for classic retro styling. Large, custom-styled taillight and attractive retro-styled turn-signal indicators. Curb Weight* 573 lbs. 560 lbs.